The performance venue for Full City+. Photo by Manhattanville Coffee. BOTTOM LINE: Full City+ hits the mark as a live sitcom, but falls short of its space's potential. Performance studies junkies will be disappointed; the audience does not sit and wait, only to discover that their pre-show small talk has been the performance for anyone in earshot. Instead, the beginning is clear: a clear brightening of lights followed by an introduction to the Full City+ sitcom. The coffee shop/restaurant sitcom scene is well-trod territory—from Friends's Central Perk to Seinfeld's Tom's Diner—and for good reason. 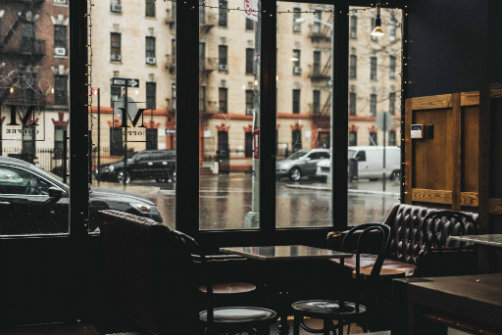 Diners and cafes get well-loved characters out of the house, into a familiar space where new characters can enter and leave naturally. Getting the audience invested in this cast of regulars seems to be Full City+'s goal. It's an interesting experiment: can the sitcom coffee shop translate to a live, episodic coffee shop performance? It seems to work. One or two actors aim for a wild-eyed Unbreakable Kimmy Schmidt-style energy, others opt for the low-key sarcasm of Friends, but all do well with a serviceable if stilted script. I didn't feel at a loss for not having seen the earlier episodes of the season, and I understood clearly what was going on. But Full City+ falls short of creating camaraderie and investment in the regulars because of the unwieldy way it handles its audience. Full City+ attempts to replicate the everyday interactions of a coffee shop by having characters stride around each and every table as they speak, but they have little motivation to do so. What is more, there is forced audience participation. The room cools slightly when the first volunteer is pressed into unenthusiastic service. Full City+'s tagline is all about positivity, but true to sitcom schadenfreude, the audience participation activities tend toward the humiliating. In one scenario in Episode 3, participants were asked to submit to being TP'ed by another volunteer. At another moment, a few audience members were bustled into performing an aimless-feeling whoosh-gesture with one of the actors, traveling slowly across the length of the long room. Making audience members the victims of the cast undermines the feeling of friendship in Full City+'s fictional coffee shop, and is a disservice to the feeling of being onstage that the venue naturally inspires. It also made Episode 3's final monologue feel deeply out of place: a didactic, sappy speech about togetherness and self-acceptance and... God? Manhattanville Coffee is worth a visit just for the tasty snacks and lovely drinks. There's no better place to spend a chilly autumn evening than warming up with some of their steamed apple cider. For the brave-hearted sitcom fan, most of the performance will also be a treat. In the spirit of Halloween, however, others may come away feeling tricked. Full City+ is conceived and written by Keith R. Huff and Joe Salvatore. Produced in collaboration with Manhattanville Coffee. The cast is Marissa Feinberg, Sarah Misch, John Noel, Andy Wagner, and Karl O'Brian Williams.